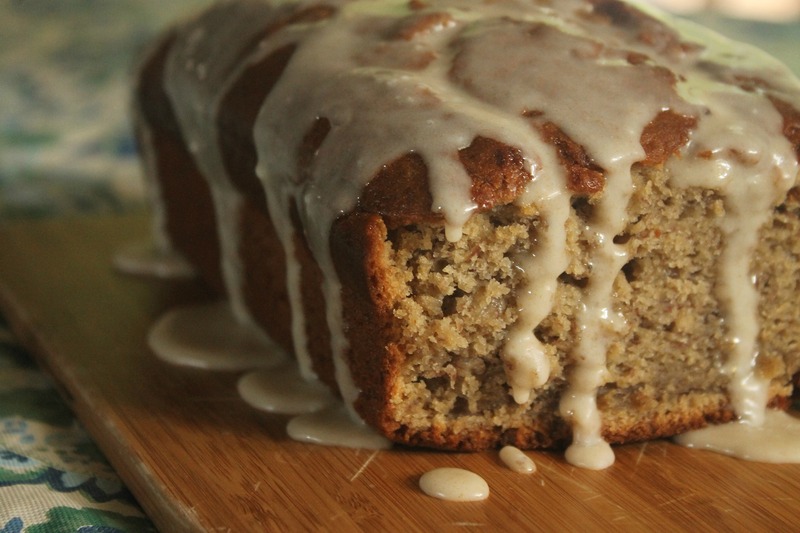 Our very favorite recipe for banana bread comes from the Cook’s Illustrated Cookbook and it is absolutely amazing. However, that recipe calls for six bananas, and we only had three on hand and really wanted to make some good banana bread. So, after browsing through a couple of issues of Cooking Light, we found this bread. It did not disappoint! Banana slices are caramelized with butter and brown sugar, and mixed in with a few other ingredients, one of them rum (unfortunately, we don’t really keep rum around, so we just added 2 teaspoons of vanilla extract). For the glaze, butter is browned in a pan (this gives it a caramel sort of flavor) and mixed with powdered sugar and half-and-half. What’s not to love? This banana bread is awesome- and even though it’s from Cooking Light, it is definitely not light (1/16 of the loaf is 190 calories. This loaf totally only makes 8 servings in our opinion!). But, for a special occasion, it is a delicious way to start the day. Melt 3 tablespoons butter in a large skillet over medium-high heat. Add brown sugar and bananas; sauté 4 minutes, stirring occasionally. Remove from heat; cool 10 minutes. Place banana mixture in a large bowl. Beat with a mixer at medium speed until smooth. Combine buttermilk and next 3 ingredients (through eggs). Weigh or lightly spoon flour into dry measuring cups; level with a knife. Combine flour, baking soda, and salt. Add flour mixture and buttermilk mixture alternately to banana mixture, beginning and ending with flour mixture; beat at low speed just until combined. Scrape batter into a 9 x 5-inch metal loaf pan coated with baking spray. Bake at 350° for 1 hour or until a wooden pick inserted in center comes out with moist crumbs clinging. Cool for 10 minutes in pan on a wire rack. Remove bread from pan, and cool on wire rack. Melt remaining 1 tablespoon butter in a small, heavy saucepan over medium-high heat. Cook 3 minutes or until butter begins to brown (be careful at this step- a few extra seconds and the butter can go from browned to burned); remove from heat. Add powdered sugar and half-and-half, stirring with a whisk until smooth. Drizzle glaze over bread. Let stand until glaze sets. Enjoy!